Konrad Hermann Josef Adenauer (January 5, 1876 – April 19, 1967) was first Chancellor of West Germany from 1949-1963, and chairman of the Christian Democratic Union from 1950 to 1966. After graduating in 1901 he practiced law in Cologne, then entered politics in 1906 as a member of the City Council. By 1917 he was Mayor. When Adolf Hitler came to power in 1933 he was President of the Prussian State Council and of the Council of German Cities. He was shortly removed from office. Until released from prison in 1944, he was either in detention or keeping a low profile due to his anti-Nazi convictions. He was a founding member of the CDU and in late 1948 drafted the constitution of what became the Federal Republic. Winning the 1949 election in partnership with the Christian Social Union, he became Chancellor on September 15. With others, he is considered to be a founding father of the post-World War II European institutions including the Council of Europe and the European Union. Deeply committed to democracy, he anchored the new Germany firmly in the West, fully subscribing to the vision of a more unified Europe in which war would become not only unthinkable but materially impossible. He knew that a totally humiliated Germany would bode ill for the future, so successfully negotiated with the victors of World War II an end to the dismantling of Germany's industry and permission to create a small defense force, which led to membership of the North Atlantic Treaty Organization. His insistence on retaining industry proved vital; Germany experienced economic growth during his administration. Eager to restore Germany's moral standing, he negotiated recognition of Israel and a compensation agreement for Jewish suffering during the Nazi era. Adenauer came late to high office yet had the integrity, commitment and experience to lead his nation at a time of crises. Germany's rehabilitation and reconstruction owe much to his legacy. He steered a course that successive German leaders have followed, one that has situated Germany as a major champion of peace and human solidarity, replacing past competition and conflict with cooperation and defense of basic freedoms across the globe. Konrad Adenauer was born as the third of five children of Johann Konrad Adenauer (1833-1906) and his wife Helene (1849-1919) (née Scharfenberg) in Cologne, Rhenish Prussia. His siblings were August (1872-1952), Johannes (1873-1937), Lilli (1879-1950) and Elisabeth, who died shortly after birth in c. 1880. In 1894, he completed his Abitur and started to study law and politics at the universities of Freiburg, Munich and Bonn. He was a member of several Roman Catholic students’ associations under the K.St.V. Arminia Bonn in Bonn. He finished his studies in 1901 then worked as a lawyer at the court in Cologne. As a devout Roman Catholic, he joined the Centre Party in 1906 and was elected to Cologne’s city council in the same year. In 1909, he became Vice-Mayor of Cologne. From 1917 to 1933, he served as Mayor of Cologne. He had the unpleasant task of heading Cologne in the era of British occupation following the First World War and lasting until 1926. He managed to establish good relations with the British military authorities and flirted with Rhenish separatism (a Rhenish state as part of Germany, but outside Prussia). During the Weimar Republic, he was president of the Prussian State Council (Preußischer Staatsrat) from 1922 to 1933, which was the representative of the Prussian cities and provinces. When the Nazis came to power in 1933, the Center Party lost the elections in Cologne and Adenauer fled to the abbey of Maria Laach, threatened by the new government after he refused to shake hands with a local Nazi leader. His stay at this abbey, which lasted for a year, was cited by its abbot after the war, when accused by Heinrich Böll and others of collaboration with the Nazis. He was imprisoned briefly after the Night of the Long Knives in mid-1934. During the next two years, he changed residences often for fear of reprisals against him by the Nazis. In 1937, he was successful in claiming at least some compensation for his once confiscated house and managed to live in seclusion for some years. According to Albert Speer in his book Spandau: The Secret Diaries, Hitler expressed admiration for Adenauer, noting his building of a road circling the city as a bypass, and of a “green belt” of parks. However, both Hitler and Speer felt that Adenauer’s political views and principles made it impossible for him to play any role within the Nazi movement or be helpful to the Nazi party. After the failed assassination attempt on Hitler July 20, 1944, he was imprisoned for a second time as an opponent of the regime. The Gestapo could not prove he played an active role in the plot and he was released some weeks later. Shortly after the war ended the Americans installed him again as Mayor of Cologne, but the British Director of Military Government in Germany, Gerald Templer, dismissed him for what he said was his alleged incompetence. After his dismissal as Mayor of Cologne, Adenauer devoted himself to building a new political party, the Christian Democratic Union (CDU), which he hoped would embrace both Protestants and Roman Catholics in a single party. In January 1946, Adenauer initiated a political meeting of the future CDU in the British zone in his role as doyen (the oldest man in attendance, Alterspräsident) and was informally confirmed as its leader. Adenauer worked diligently at building up contacts and support in the CDU over the next years, and he sought with varying success to impose his particular ideology on the party. His was an ideology at odds with many in the CDU, who wished to unite socialism and Christianity; Adenauer preferred to stress the dignity of the individual, and he considered both communism and Nazism materialist world views that violated human dignity. Adenauer’s leading role in the CDU of the British zone won him a position at the Parliamentary Council of 1948, called into existence by the Western Allies to draft a constitution for the three western zones of Germany. He was the chairman of this constitutional convention and vaulted from this position to being chosen as the first head of government once the new “Basic Law” had been promulgated in May 1949. At the German federal election, 1949, Adenauer became the first Chancellor of the Federal Republic of Germany after World War II. He held this position from 1949 to 1963, a period which spans most of the preliminary phase of the Cold War. During this period, the post-war division of Germany was consolidated with the establishment of two separate German states, the Federal Republic of Germany (West Germany) and the German Democratic Republic (East Germany). The first elections to the Bundestag of West Germany were held on 15 August 1949, with the Christian Democrats emerging as the strongest party. Theodor Heuss was elected first President of the Republic, and Adenauer was elected Chancellor on 16 September 1949. He also had the new "provisional" capital of the Federal Republic of Germany established at Bonn, which was only 15 kilometers away from his hometown, rather than at Frankfurt am Main. Adenauer’s achievements include the establishment of a stable democracy in defeated Germany, a lasting reconciliation with France, a general political reorientation towards the West, recovering limited but far-reaching sovereignty for West Germany by firmly integrating it with the emerging Euro-Atlantic community (NATO and the Organization for European Economic Cooperation). He enjoyed a very good working relationship with John Foster Dulles, the United States Secretary of States. Adenauer is associated with establishing an efficient pension system, which ensured unparalleled prosperity for retired persons, and - along with his Minister for Economic Affairs and successor, Ludwig Erhard - with the West German model of a “social market economy” (a mixed economy with capitalism moderated by elements of social welfare and Catholic social teaching), which allowed for the boom period known as the Wirtschaftswunder (“economic miracle”) and produced broad prosperity. Thus, Adenauer ensured a truly free and democratic society which had been almost unknown to the German people before - notwithstanding that more or less hopeless attempt between 1919 and 1933 (the Weimar Republic) - and which is today not just normal but also deeply integrated into modern German society. He thereby laid the groundwork for the Western world to trust Germany again. Precisely because of Adenauer’s former policy, a later reunification of both German states was possible. A unified Germany has remained part of the European Union and NATO. His successful negotiation for retention of German industry was crucial; this became the foundation on which the world's third largest economy would be re-built. It was due to his own anti-Nazi credential that the victors of World War II trusted him to equip Germany with a defense force, the Bundeswehr, that was from the outset to be fully integrated into NATO, which Germany joined in 1955. Initially, the plan was to join the European Defense Community but this initiated failed. Adenauer praised the Marshall Plan, which he described as "a glorious page in the history of the United States of America." The Plan compensated for what he saw as the failings of the Allied administration 1945-1949 which had seen a "a rapid economic, physical, and psychological disintegration of the Germans which might have been avoided" if they had handed over governance sooner. However, contemporary critics accused Adenauer of cementing the division of Germany, sacrificing reunification and the recovery of territories lost to Poland and the Soviet Union for the sake of speedy integration into the West. During the Cold War, he advocated West German rearmament and mandatory conscription as an answer to a similar development in East Germany. The 1952 Stalin Note offered to unify the two German states into a single, neutral, disarmed Germany to effect superpower disengagement from Central Europe. One opinion claims that Adenauer shared the Western Allies’ suspicion about the genuineness of that offer and supported the Allies in their cautious replies, the other one claims he did so because proposed neutrality and rearmament ban spoiled his plans to annex territories seceded to Poland later. Adenauer’s critics, especially on the nationalist side, denounced him for having missed an opportunity for early German reunification. Adenauer’s defenders claimed, and continue to argue, that given the realities of the Cold War, reunification and the recovery of lost territories were not realistic goals. Both of Stalin's notes specified the retention of the existing "Potsdam" boundaries of Germany. Others criticize his era as culturally and politically conservative, which sought to base the entire social and political make-up of West Germany around the personal views of a single person, one who bore a certain amount of mistrust towards his own people. The West German student movement of the late 1960s was essentially a protest against the conservatism Adenauer had personified. Another point of criticism was that Adenauer’s commitment to reconciliation with France was in stark contrast to a certain indifference towards Communist Poland. Like all other major West German political parties of the time, the CDU refused to recognize the annexation of former German territories given by the Soviets to Poland, and openly talked about regaining these territories after strengthening West Germany’s position in Europe. In retrospect, mainly positive assessments of his chancellorship prevail, not only with the German public, which voted him the “greatest German of all time” in a 2003 television poll, but even with some of today’s left-wing intellectuals, who praise his unconditional commitment to western-style democracy and European integration. Made a historic speech to the Bundestag in September 1951 in which he recognized the obligation of the German government to compensate Israel, as the representative of the Jewish people, for the Holocaust. This started a process which led to the Bundestag approving a pact between Israel and Germany in 1953 outlining the reparations Germany would pay to Israel. Helped secure the release of the last German prisoners of war in 1955, a decade after the end of the war. Opened diplomatic relations with the USSR and other Eastern bloc nations, but refused to recognize East Germany. Nonetheless, his relations with the USSR may have served as a foundation for the later policy of rapprochement with the East pursued by Willy Brandt and others that contributed to Cold War ending with the collapse of the Eastern bloc, and German reunification. Reached an agreement with the USA in 1957 that gave West Germany possession of weapons capable of transporting nuclear warheads. Furthermore, Adenauer pursued nuclear cooperation with other countries with a goal of Germany being able to produce its own nuclear armament. Oversaw the reintegration of Saarland with West Germany in 1957. Briefly considered running for the office of President in 1959. However, he instead chose a candidate (Heinrich Lübke) whom he believed weak enough not to disturb his affairs as Chancellor. For all of his efforts as West Germany’s leader, Adenauer was named TIME magazine’s Man of the Year in 1953. In 1954, he received the Karlspreis (English: Charlemagne Award), an Award by the German city of Aachen to people who contributed to the European idea and European peace. In his last years in office Adenauer used to take a nap after lunch and, when he was traveling abroad and had a public function to attend, he sometimes asked for a bed in a room close to where he was supposed to be speaking, so that he could rest briefly before he appeared. Adenauer found relaxation and great enjoyment in the Italian game of bocce and spent a great deal of his post political career playing the game. Video footage of his games can be seen in various segments from the German Festival Documentary and from the History Channel special about Adenauer. On March 27, 1952, a package addressed to Chancellor Adenauer exploded in the Munich Police Headquarters, killing one police officer. Two boys who had been paid to send this package by mail had brought it to the attention of the police. Investigations led to people closely related to the Herut Party and the former Irgun organization. The German government kept all proof under seal. Five Israeli suspects identified by French and German investigators were allowed to return to Israel. One of the participants, Eliezer Sudit, later indicated that the mastermind behind the attempt was Menachem Begin who would later become the Prime Minister of Israel. Begin had been the former commander of Irgun and at that time headed Herut and was a member of the Knesset. His goal was to undermine the attempts of the German government to seek friendly relations with Israel. In June 2006 a slightly different version of this story appeared in one of Germany’s leading newspaper, Frankfurter Allgemeine Zeitung, quoted by The Guardian. Begin had offered to sell his gold watch as the conspirators ran out of money. The bomb was hidden in an encyclopedia and it killed a bomb-disposal expert, injuring two others. Adenauer was targeted because he was sending Holocaust reparations to the Israeli government, whereas Begin felt passionately that the money should go to the individual victims. Sudit, the story’s source, explained that the “intent was not to hit Adenauer but to rouse the international media. It was clear to all of us there was no chance the package would reach Adenauer.” The five conspirators were arrested by the French police, in Paris. They “were [former] members of the … Irgun” (the organization had been disbanded in 1948, four years earlier). In 1962, a scandal erupted when police under cabinet orders arrested five Der Spiegel journalists, charging them with high treason, specifically for publishing a memo detailing alleged weaknesses in the West German armed forces. The cabinet members, belonging to the Free Democratic Party, left their positions in November 1962, and Defense Minister Franz Josef Strauss, himself the chairman of the Christian Social Union, was dismissed, followed by the remaining Christian Democratic Union cabinet members. Adenauer managed to remain in office for almost another year, but was eventually forced to resign and was succeeded as Chancellor by Ludwig Erhard. He did remain chairman of the CDU until 1966. His state funeral in Cologne Cathedral was attended by a large number of world leaders, among them US president Lyndon B. Johnson on his only visit to a European country. After the service, his body was brought back to Rhöndorf on the Rhine aboard Kondor, a Jaguar class fast attack craft of the German Navy. He is interred on the Waldfriedhof. Adenauer was not only fully committed to a more unified Europe but keenly supported the concept of a United States of Europe. He believed that the nations of Europe have histories but he supported a union of Germany and France, which would "A union between France and Germany would give new life and vigor to a Europe that is seriously ill." He believed that European states were ready to "renounce part of their sovereignty, voluntarily and without compulsion, in order to transfer the sovereignty to a supranational structure." In my opinion the European nation states had a past but no future. This applied in the political and economic as well as in the social sphere. No single European country could guarantee a secure future to its people by its own strength. I regarded the Schuman Plan and the European Defense Community as preliminary steps to a political unification of Europe…. The creation of the Council of Europe, the founding of the European Community for Coal and Steel, and the establishment of a European Defense Community were to serve the pacification of Europe. The supranational organizations in particular were to bring the contracting powers so close together through renunciation of sovereignty that wars inside Europe would become impossible. With much care and circumspection a political constitution for Europe was already being worked out. The Federal Republic was involved in this work. It had meanwhile become a member of numerous European organizations. Germany had to become a reliable partner in the nascent community of European peoples. He disliked nationalism because he believed that this had led Germany in the wrong direction previously. In writing the following, he had Hitler in view: "For many decades, the German people had suffered from a wrong attitude to the state, to power, to the relationship between the individual and the state. They made an idol of the state and set it upon an altar; the individual’s worth and dignity had been sacrificed to this idol." October 13, 1950 - Robert Lehr (CDU) succeeds Heinemann as Minister of the Interior. March 15, 1951 - Konrad Adenauer becomes Minister of Foreign Affairs as well as Chancellor when the Allies allow this post to be revived. July 19, 1952 - Fritz Neumayer (FDP) succeeds Wildermuth (d. March 9) as Minister of Construction. June 7, 1955 - Theodor Blank (CDU) becomes Minister of Defense when that post is revived. June 8, 1955 - Heinrich von Brentano (CDU) succeeds Adenauer as Minister of Foreign Affairs. Hans-Joachim von Merkatz (DP) succeeds Hellwege as Minister of Bundesrat Affairs. November 12, 1955 - Tillmanns leaves the cabinet. October 16 1956 - Franz Josef Strauss (CSU) succeeds Blank as Minister of Defense. Hans-Joachim von Merkatz succeeds Neumayr as Minister of Justice. Kraft and Schäfer leave the Cabinet. Siegfried Balke (CSU) succeeds Strauss as Minister of Atomic Affairs. November 15, 1956 - Ernst Lemmer (CDU) succeeds Balke as Minister of Posts and Communications. September 13, 1959 - Werner Schwarz (CDU) succeeds Lübke as Minister of Food, Agriculture, and Forestry. April 5, 1960 - Oberländer resigns as Minister of Displaced Persons, Refugees, and War Victims. May 4, 1960 - Hans Wilhelmi (CDU) succeeds Lindrath (d. 27 February) as Minister of Federal Economic Possessions. October 27, 1960 - Hans-Joachim von Merkatz (CDU) becomes Minister of Displaced Persons, Refugees, and War Victims. November 19, 1962 Ewald Bucher (FDP) succeeds Stammberger as Minister of Justice. Werner Dollinger (CSU) succeeds Lenz as Minister of Federal Treasure. December 14, 1962 - Rolf Dahlgrün (FDP) succeeds Starke as Minister of Finance. Bruno Heck (CDU) succeeds Wuermeling as Minister of Family and Youth Affairs. Hans Lenz (FDP) enters the ministry as Minister of Scientific Research. Rainer Barzel (CDU) succeeds Lemmer as Minister of All-German Affairs. Alois Niederalt (CSU) succeeds Merkatz as Minister of Bundesrat and State Affairs. The Ministry of Nuclear Energy and Water is abolished, and Balke leaves the cabinet. January 9, 1963 - Kai-Uwe von Hassel (CDU) succeeds Strauss as Minister of Defense. Konrad Adenauer has been described as “one of the most gifted statesmen of modern times”. In setting Germany on a course that led to her it has been said that he accomplished a “titanic achievement.” He was the oldest chancellor ever to serve Germany, leaving at the age of 87. "Konrad Adenauer had already guided the hated land of the Hun and the Nazi back to moral respectability and had earned himself a seat in the highest councils of the Western powers." Adenauer was included on one of the most recent and famous gold commemorative coins: the Belgian 3 pioneers of the European unification commemorative coin, minted in 2002. The obverse side shows a portrait with the names Robert Schuman, Paul-Henri Spaak, and Konrad Adenauer. HQ of the Konrad Adenauer Foundation. There is a Konrad Adenauer Foundation with headquarters in Berlin. Associated with the CDU, this is the largest politically affiliated research institution in Germany. Founded in 1956 it was renamed in his honor in 1964. ↑ Albert Speer. 1976. Spandau: the secret diaries. (New York, NY: Macmillan. ISBN 9780026128100), 137. ↑ Konrad Adenauer, 1949, Konrad Adenauer, speech in Berne (23rd March, 1949) Spartacus. Retrieved December 20, 2008. ↑ Alix Kroeger, 2003. Adenauer voted Germany's greatest. BBC News. Retrieved December 20, 2008. ↑ 4.0 4.1 Konrad Adenauer. TIME, June 4, 1954. Retrieved December 20, 2008. ↑ 6.0 6.1 Luke Harding, 2006. Menachem Begin 'plotted to kill German chancellor'. The Guardian (UK). Retrieved December 20, 2008. ↑ Konrad Adenauer, 1950, Konrad Adenauer was interviewed by Joseph Kingsbury-Smith (March 7, 1950). Spartacus. Retrieved December 20, 2008. ↑ Konrad Adenauer, 1952, Speech on the European Coal and Steel Community. Spartacus. Retrieved December 20, 2008. ↑ Konrad Adenauer, 1966, Una Pagina Classica / A Classic Text. Memoirs, 1945 – 1953. (Chicago, IL: Henry Regnery), 363–364, 416–417. Retrieved December 20, 2008. ↑ Joseph Shattan. 1990. Architects of Victory: Six Heroes of the Cold War. (Washington, DC: Heritage Foundation. ISBN 9780891950844), 96. ↑ Paul Johnson. 1991. Modern Times: The World from the Twenties to the Nineties. (New York, NY: Harper Perennial. ISBN 9780060168339), 584. Alexander, Edgar. 1978. Adenauer and the new Germany, the chancellor of the vanquished. Ann Arbor, MI: University Microfilms International. Annan, Noel Gilroy Annan. 1983. How Dr. Adenauer rose resilient from the ruins of Germany. Bithell memorial lecture, 1982. London, UK: Institute of Germanic Studies, University of London. ISBN 9780854571161. Dönhoff, Marion. 1982. Foe into friend: the makers of the new Germany from Konrad Adenauer to Helmut Schmidt. New York, UK: St. Martin's Press. ISBN 9780312296926. Frei, Norbert. 2002. Adenauer's Germany and the Nazi past: the politics of amnesty and integration. New York, NY: Columbia University Press. ISBN 9780231118828. Gunther, John. 1961. Inside Europe Today. New York, NY: Harper and Brothers. Hiscocks, Richard. 1966. The Adenauer era. Philadelphia, PA: Lippincott. Irving, Ronald Eckford Mill. 2002. Adenauer. London, UK: Longman. ISBN 9780582068247. Johnson, Paul. 1991. Modern Times: The World from the Twenties to the Nineties. New York, NY: Harper Perennial. ISBN 9780060168339. McGhee, George Crews. 1989. At the creation of a new Germany: from Adenauer to Brandt : an ambassador's account. New Haven, CT: Yale University Press. ISBN 9780300042504. Schwarz, Hans-Peter. 1995. Konrad Adenauer: a German politician and statesman in a period of war, revolution, and reconstruction. Providence, RI: Berghahn Books. ISBN 9781571818706. Shattan, Joseph. 1990. Architects of Victory: Six Heroes of the Cold War. Washington, DC: Heritage Foundation. ISBN 9780891950844. Speer, Albert. 1976. Spandau: the secret diaries. New York, NY: Macmillan. ISBN 9780026128100. Weymar, Paul. 1957. Adenauer, his authorized biography. New York, NY: Dutton. 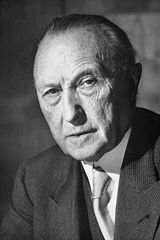 BBC History: historic figures: Konrad Adenauer (1876-1967). Interview with Chancellor Konrad Adenauer (1957). This page was last modified on 23 April 2018, at 15:39.